First of all, I would like to state that the pictures are for my enjoyment. They will not be mass produced. Here is Palladium Copyright. Now with that out of the way. 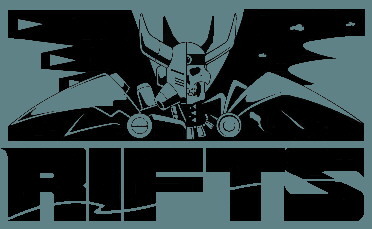 This is my Rifts/Robotech page. I hope you like it. I do have a complete list of the following groups. If I am missing something in these groups please email me from my Bio's page about it. Please include the book and page number of the item. Jedi Knight - If you ever wanted to play one. Kindred RCC - WhiteWolf vampires converted to Palladium format. Alfarian RCC - And yet another Tribe for the Werecreatures. Still working on this one. Well I bought the Cyber-Knights: Siege on Tolkeen book four. And I will have to say that it is pretty good. I like the detail and history of the knights. But it leaves me with a feeling that there should have been more. I hope that Kevin will keep up on the comings and going of the Knights and how the Coalition views them.